Mapped from DEP Wetlands data: coastal band, bluff, or sea cliff, coastal dune, coastal beach, rocky Intertidal shore, tidal flat, salt marsh, arrier beach system, barrier beach–coastal beach, barrier beach–coastal dune, barrier beach–salt marsh, open water tidal, brackish, salt pond. Coastal habitats range from coastal uplands (dunes, coastal banks, sea cliffs, and coastal heathlands and shrublands) to a variety of wetland? 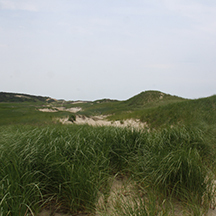 areas (salt marshes, estuaries and embayments, beaches, rocky intertidal shores, and the ocean).